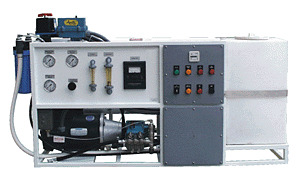 Big Brand Water Fitler, Inc offers the SeaPro Seawater Desalination Membrane Filtration Systems suitable for commercial, offshore and marine specific applications. The Big Brand SeaPro desalination membrane filtration systems range in output capacities from 600 GPD to 50,000 GPD (8 mï¿½/hr) and effectively produce fresh treated water, free of particulate matter or contaminants from a seawater source. The SeaPro systems are available in standard and custom-made specifications to meet the requirements of a classified area. 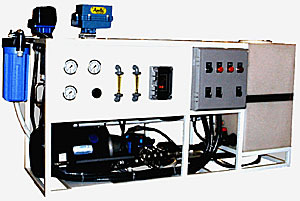 The cost-effective, easy-to-operate and efficient Big Brand SeaPro reverse osmosis systems systems are built to withstand the harsh offshore and marine environments, always providing a source of fresh water ï¿½ whenever and wherever itï¿½s needed. The Big Brand SeaPro systems feature corrosion resistant components, flexible control features and a variety of other standard features. The Big Brand SeaPro systems purify seawater to provide fresh water for drinking and other sanitary needs, equipment wash down, boiler makeup feed water, engine cooling, and other requirements.